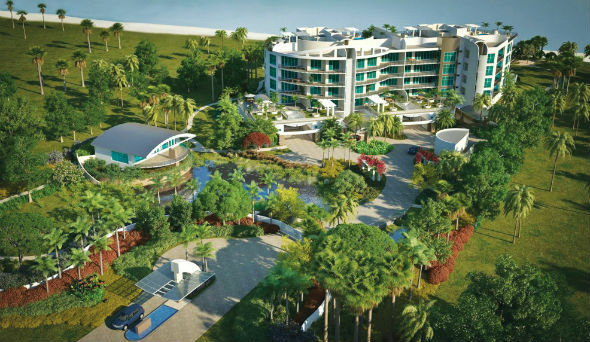 Residents exploring Longboat Key in search of luxury living may want to take a trip to the community's Aria Condominiums. Built in 2016, you will have the chance to break in your freshly designed new home on sunny Longboat Key. Read more about Aria condos. Longboat Key is a gorgeous island located off the western coast of Florida, filled with luscious green acres that come as close to paradise on earth as one can get. This island is just north of Lido and is a short distance from Sarasota and Bradenton, proving that one can have the best of both worlds, a relaxing island to spend one's days on and a thriving community to immerse oneself in. Brightness is all around the Aria condos. They will probably exceed your expectations in terms of opulent living. Even in its flush appearance, it is still cozy and down-to-earth enough to kick off your shoes and call your condo unit home sweet home. Each unit features a stunning view of the lush grounds and the shimmering water from the Gulf of Mexico, the lagoon or the shimmering swimming pool. Sometimes you can see more than one, depending on your unit's position. Other community amenities include a modern wellness center that features an aquatics center and several classrooms and a resident's club with a kitchen and catering services. Don't let your captivating view of paradise distract you from each unit's amazing interior. You can choose a floor plan that meets your lifestyle needs, which might include a stonework fireplace, arched doorways, fine stained glass windows and hand-painted ceramic tiles. Each unit features an average 3,500-4,000 square footage and ceilings that reach to 10-feet to add to your feeling of living in wide open places that still retain large measures of warmth and coziness. Residents interested in additional green space might tour the penthouse condo units that intensive serenity and a sweeping view of the community, Longboat Key and beautifully beyond. A move to Aria on Longboat Key offers you an opportunity to experience exclusive living in an enriching and private environment that also features easy access to Sarasota for work or trips for fine dining, shopping and entertainment options.